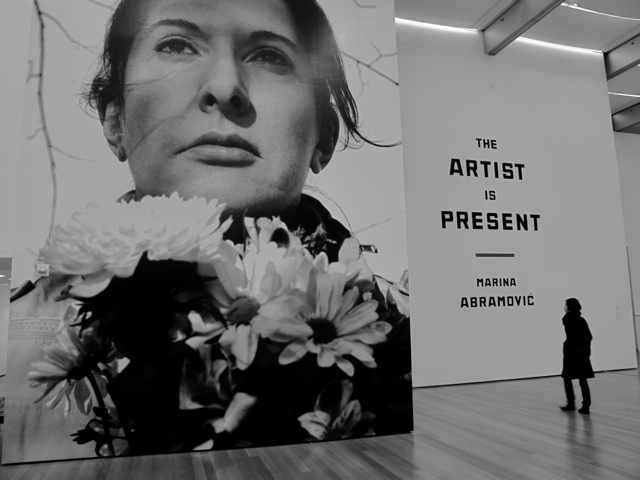 Marina Abramovic, The Artist is Present, MoMA. Installation view with Portrait with Flowers, 2009. All photos by Ipek Irgit for Art Observed unless otherwise noted. 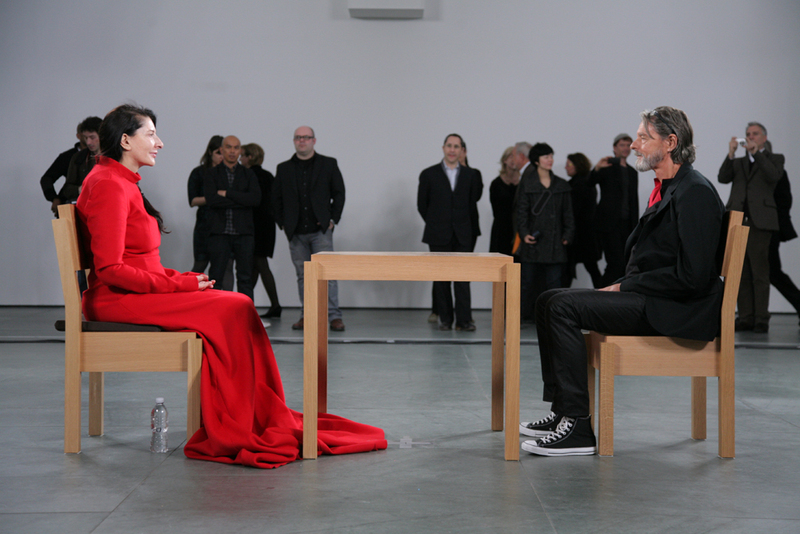 Sitting in front of Marina Abramović seems to create a plethora of meaning; all subjective, personal to the particular collaborator. Discussions about the exhibition and the experience seem to ensue all over town these days. Many questions: “But what if you make her laugh? I think I’d try,” (a rather crass thought) or, “What if you touch her?” But for most I think such ruinous thoughts are immediately dispelled once in her presence. Even from a far the seriousness of her mission and her willful energy is quieting, consuming, and even awe-inspiring. 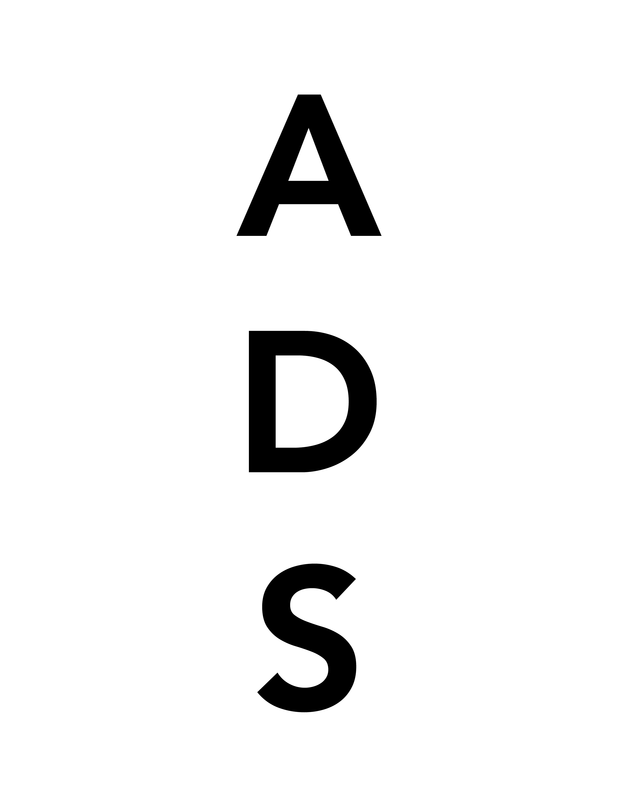 In a recent New York Times article, “Who’s Afraid of Marina?” Randy Kennedy interestingly, and rightly, focuses on the audience response to the exhibition. 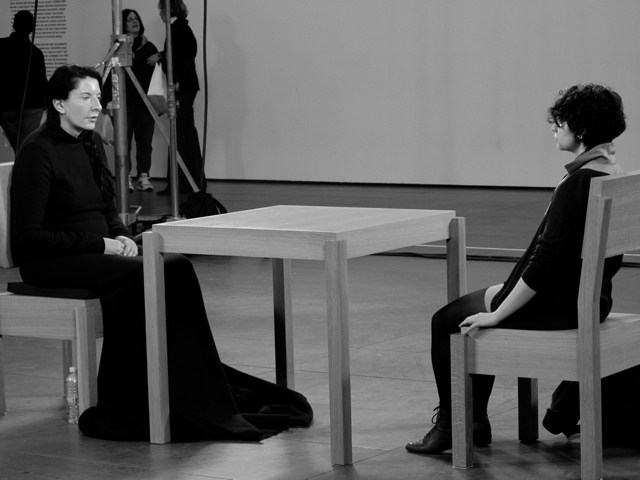 Marina Abramovic, The Artist is Present, 2010. Detail. 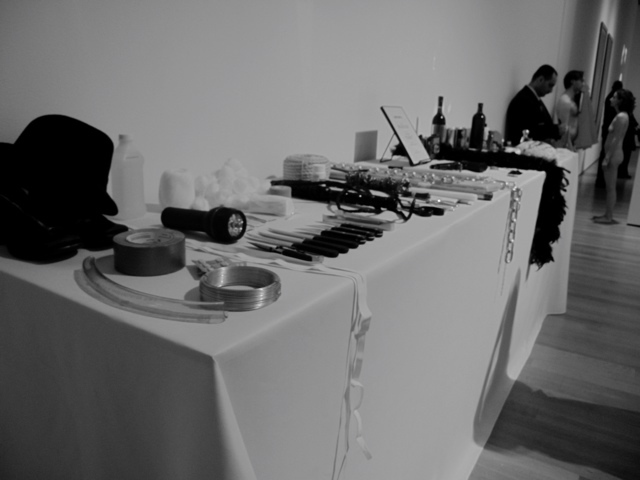 Of particular note is the effect it has had on 48 year-old, New York make-up artist, Paco Blancas, who returned to the exhibition galleries so frequently as to become friendly with the gallery guards. Blancas then proceeded to sit with Marina for an entire seven-hour day uninterrupted. More than any other visitor Blancas has managed to insert himself into Abramović’s artwork to rather dramatic and powerful ends; Kennedy described it as “a kind of personal performance piece.” [New York Times] To Kennedy, Blancas described the experience of sitting with her thus “When you sit across from her, and look into her eyes, you feel the public but you don’t see them anymore. 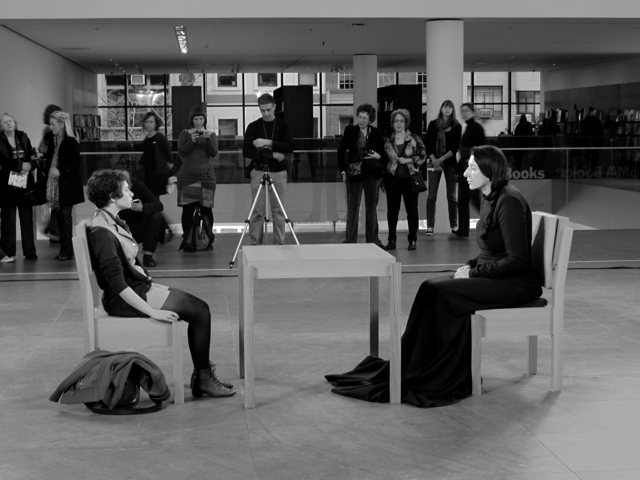 It’s almost like you are alone with her in this big museum, which is like being a part of the art yourself.” This is entirely in keeping with Abramović’s own understanding of the artist/audience relationship. 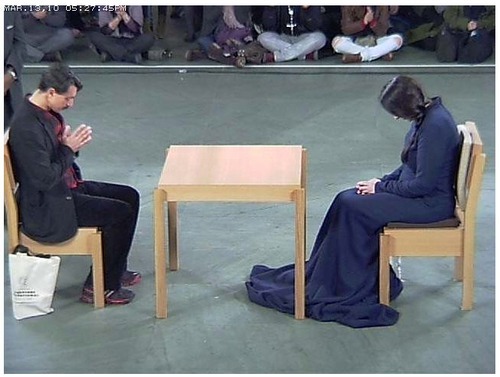 Nonetheless, possibly the most moving incident in this new performance occurred on the opening night when Ulay (Frank Uwe Laysiepen) Abramović’s former collaborator and lover (the subject in many of the reperformances on the sixth floor) was the second person to take the seat opposite Abramović, at one point reaching out to take her hands in his. The effect on the artist was incomparable to any other moment so far in the performance. 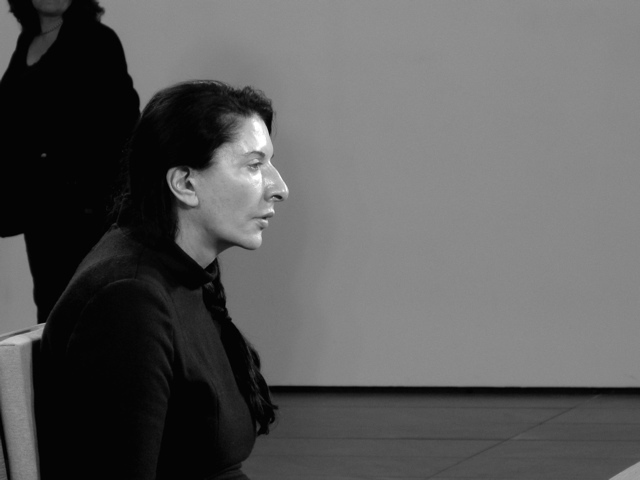 It was a powerful and memorable event that provoked tears to roll down Abramović’s face. What is more, it was a welcome action that brought the past into the present, as do the reperformances occurring upstairs. Ulay and Abramović famously performed Night Sea Crossing, which similarly involved gazing at each other across a table for seven-hour periods; echoes of this piece reverberated around the room as it was effectively recreated, or at the very least referenced. Upstairs the audience can find an significant volume of works packed into the gallery space, a stark contrast to the airiness of the atrium. One girl we visited with literally cried her way through the exhibition; intensity is high. The pace and the drama are stepped-up for this sixth floor exhibition. 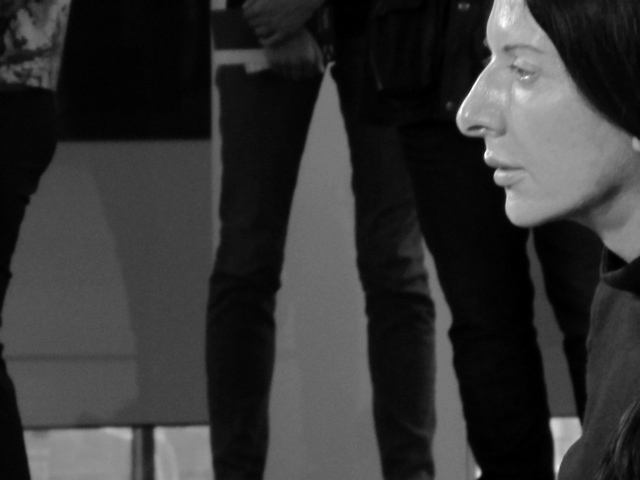 The exhibition is a chronological blast through Abramović’s most prolific performances starting with “Rhythm 10,” where she furiously stabbed at the spaces between her splayed fingers on the gallery floor, swapping knives when she cut herself. This is quickly followed by the equally daring “Rhythm 0,” where she encouraged the audience to do whatever they wished to her body with the help of 72 objects selected by the artist, including pins, a scalpel and a gun. Installation view of ‘The Artist is Present’. 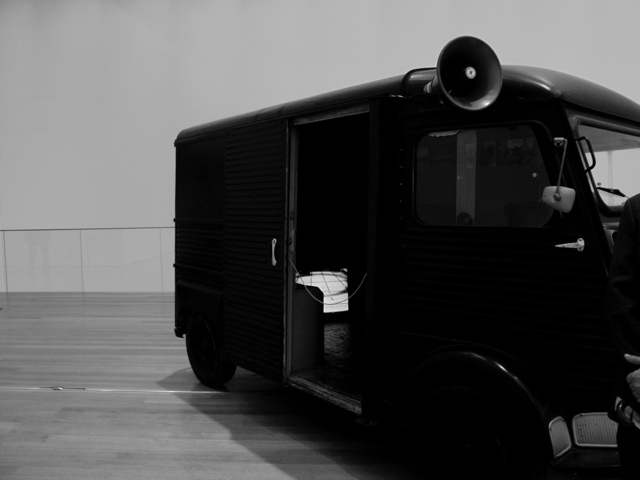 Object from Ulay and Marina Abramovic, Relation in Movement, 1977. Reperformance of Luminosity (1997), 2010. 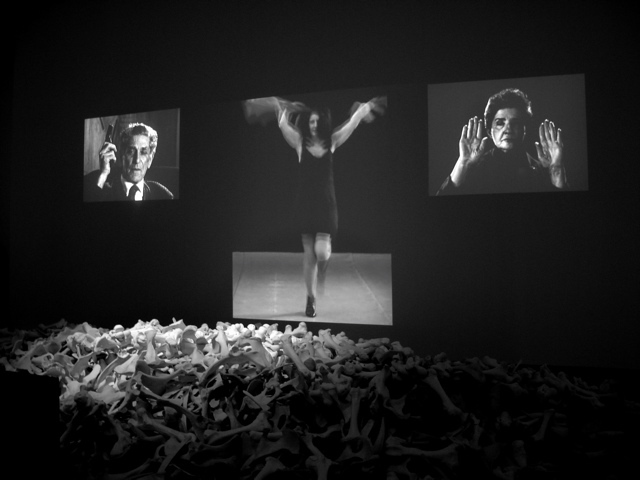 Marina Abramovic, video footage and bones from Balkan Baroque, 1997. ‘The Artist is Present’, installation view. 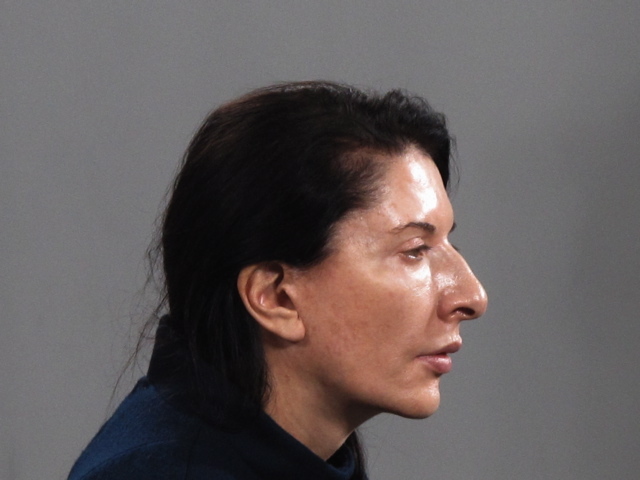 Marina Abramovic, The Artist is Present, 2010. This entry was posted on Wednesday, March 31st, 2010 at 1:39 pm	and is filed under AO On Site. You can follow any responses to this entry through the RSS 2.0 feed. You can leave a response, or trackback from your own site. Marina’s work is one of a kind due to its originality. no other artist has managed to become famous through performance art. my big question in general is wether that kind of art is based on p[hysical strength because the main part is using your body to create memorable scenes in an abnormal way. In the new perfomance Marina is using her ‘star’ so as to create that internal ‘glow’ which in its turn creates the interest and the respect of the audience. That’s why the audience is not actually participating but are submitted to her charm. In dance, dancers are using their body to create memorable scenes but without the ‘shocking’ factor. Therefore, may the shocking factors in Marina’s pieces is the unique point that makes her to distinguish from other artists and arts? dimitra- no other artist has managed to become famous through performance art?